The planet Jupiter is the fifth one out from the Sun and is, by far, the largest in our solar system. With an impressive diameter of 88,694 miles, it is just over 11 times larger than Earth. Its mass is one thousandth of the Sun's and over twice the total mass of all the other planets combined. Jupiter's orbit, varying between 460 million and 507 million miles from the Sun, marks the start of the outer solar system. The planet, together with Saturn, Uranus and Neptune, are referred to as the "gas giants", or Jovian planets. Such a huge planet as Jupiter is likely to weigh quite a lot and it doesn't disappoint. At 1,898,081 million million million tons, it is 317.83 times heavier than Earth. Despite that, it is mostly comprised of gas and liquid, therefore having no solid surface to speak of. It also appears to have some internal heat generating mechanism. This giving off of heat is causing the planet to shrink by as much as 2 centimetres per year. Extrapolating back, it is estimated, therefore, that, at the time of its formation, Jupiter was about twice as big as it is now. Now that's a big planet! It's a bit difficult to describe Jupiter's interior, because it's tricky to decide where its interior begins. Apart from the solid core, it has no surface. Anyway, let's consider the two inner sections. As you can see, the middle layer is by far the largest. It is thought that this layer consists of liquid metallic hydrogen, with a touch of helium thrown in. This layer accounts for three-quarters of the planet's total radius. At the centre is a comparatively tiny, solid core. There has been much conjecture about what this is made of, from rock, to ice, even to crystallized carbon in the form of diamond! Jupiter's atmosphere consists mostly of hydrogen gas, with about 10% helium. As these are the main elements in main sequence stars, the planet could be considered a "failed star". Indeed, if Jupiter's mass were only 0.5 times more than it is now, the resultant increase in gravity would cause it to shrink, until the density achieved was sufficient to initiate stellar ignition. This atmosphere is the largest in the solar system, spanning over 3,000 miles altitude. On top of that is the cloud layer, about 30 miles thick. Composed mostly of ammonia crystals, it operates differently at different altitudes and this conflict causes much turbulence, with winds possible of over 200 miles an hour. It is thought that this cloud layer mechanism might be the cause of the planet Jupiter's different coloured bands. The light bands have been designated "zones", while the darker ones are "belts". 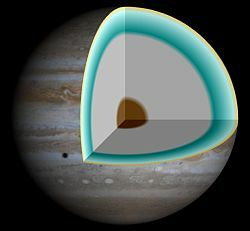 The zones can vary in intensity and width from year to year, thus causing regular differences in Jupiter's whole appearance. This is probably the most famous feature of the planet Jupiter. It is a huge storm that has been raging for centuries. Despite its name, it can vary in colour, sometimes appearing almost white. The spot's length can vary between 15,000 and 25,000 miles. Its width between 7,500 and 8,700 miles. Three planet Earths could fit inside it. It has been determined by astronomers that it is a permanent feature of the planet, having been observed possibly since 1665. It's showing no signs of going away. The storm operates at an altitude of about 5 miles above the clouds and rotates the planet at a different rate than the rest of the atmosphere. 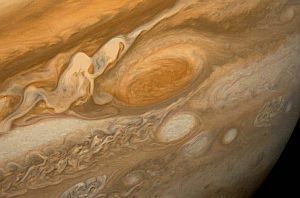 The Great Red Spot is only one of many such storms on Jupiter. Most are too small to justify naming, but, in the mid 20th century, three small storms just south of the Great Red Spot merged to form a reasonably large one. This has been christened Oval BA, or, more colloquially, Little Red Spot, or Red Spot Junior. The Planet Jupiter Has Rings! Yes, as well as the famous ones round Saturn, several other gas giants have ring systems and Jupiter is one of them. They're very faint and were only first observed by the space probe Voyager 1, in 1979. Subsequent further study of them have shown that there are four divisions. This is the closest to the planet. It is 19,000 miles wide and 7,750 miles thick, making it the thickest of all the rings. Consisting of microscopic dust particles, it is very faint. At 4,000 miles wide and between 19 and 190 miles thick, this, despite its name, is not the largest ring. It is certainly the brightest, though. It is composed not just of dust, but slightly larger particles, too. So called because it is bounded by Jupiter's moon, Amalthea, this is another very faint ring. It is 33,000 miles wide and, at the Amalthea boundary, is 1,500 miles thick. This thickness decreases towards the Jupiter end. It is comprised entirely of dust. 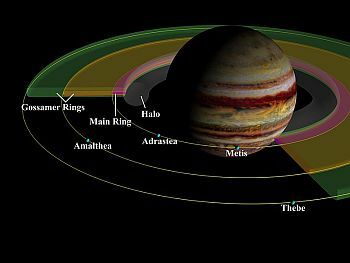 The outermost ring, it is 60,000 miles wide and 5,200 miles thick. Bounded by the moon Thebe, it is the faintest of the rings. Again, it is composed entirely of dust. An even fainter continuation of the ring beyond the orbit of Thebe has been observed. Extending an impressive 174,000 miles further into space, it has been christened the Thebe Extension. They come in all shapes and sizes. The main four, Io, Europa, Ganymede and Callisto, are designated the Galilean moons, as they were discovered, in 1610, by Galileo. Due to their importance, they have each been given a separate page of their own on this site. However, there are 63 others to get through. Like many things in astronomy, the moons have been divided into groups, which are usually named after the largest in the group. A group of four satellites, orbiting very close to the planet Jupiter. The nearest to Jupiter, this moon has an irregular shape and is 37 miles long and 21 miles wide. It lies 80,000 miles out from the planet and orbits it in just over seven hours. Next out, this moon is a mere 12.5 miles long and nine miles wide. At 80,156 miles out, it also orbits in just over seven hours, about five minutes longer than Metis. Jupiter's third moon and the largest of this group. Its length is just over 155 miles, width being about 80. It orbits at 112,500 miles out and takes around 12 hours to do it. This moon, together with the next, if you refer to the section above, are associated with Jupiter's ring system. Situated 138,000 miles out from the planet, this is the outermost of the inner Almathea Group. It is 72 miles long and 52 miles wide and takes just over 16 hours for one orbit. This is a stand alone satellite that doesn't orbit in any recognised group. Only some five miles in diameter, it is midway between the Galilean and Himalia groups. With an average distance of about 4.6 million miles from Jupiter, its orbit takes almost 130 days. There are four moons in this group. At 7,000,000 out from the planet Jupiter, this moon marks the start of the group. Its diameter is only 10 miles and its orbit takes just under 241 days. The largest of the group, thus giving it its name. With a diameter of 105 miles, it orbits the planet in just over 250 days, just over 7,000,000 miles out. 22.5 miles in diameter, this moon orbits Jupiter in 259 days and lies 7.28 million miles out from the planet. At nearly 73 million miles out, this most remote of the Himalia group is 53.5 miles in diameter and has a 259-day orbit. Another stand-alone moon, between the Himalia Group and the Ananke group. 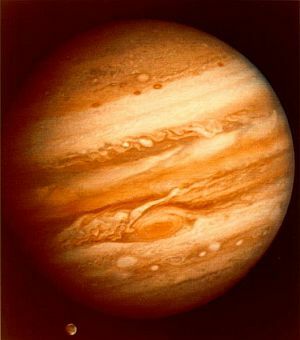 A mere one mile in diameter, it orbits Jupiter at a distance of 10.5 million miles and takes nearly 259 days to do so. A group of moons covering an area from 12 million miles out from the planet Jupiter to 14 million, most of them consist of mere rocks around one mile in diameter or less. They all affect a retrograde orbit, meaning they orbit their home planet in the opposite direction to its rotation. The main ones, as well as Ananke, are Praxidike, Iocaste, Harpalyke, Thyrone, Euanthe and Euporie. 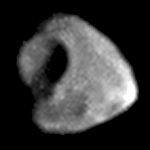 Ananke, being the largest, is 17.5 miles in diameter and these moons' orbits all take between 500 and 700 days. Other, smaller moons (diameters less than a mile) are Thelxinoe, Helike, Orthosie, Mneme, Hermippe, plus six others as yet unnamed. A group of 17 moons, orbiting at a distance between 14 and 15 million miles out from the planet Jupiter. All the orbits are retrograde, taking from 670 to 760 days. The largest, Carme, is 28.5 miles in diameter. Other, smaller moons include Herse, Aitne, Kale, Taygete, Chaldene, Erinome, Kallichore, Kalyke, Pasithee, Arche and Isonoe. All the rest are unnamed. Unlike the moons of the previous two groups, which are clumped closely together, these 15 moons are more spaced out. At the same distance from Jupiter as the Carme group, their orbits take from 700 to 800 days. 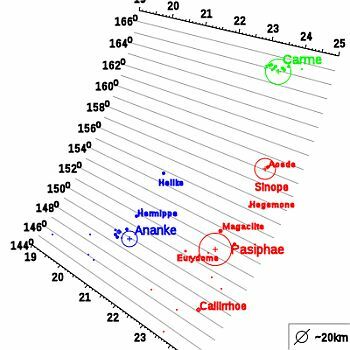 Pasiphae itself is just over 37 miles in diameter and the next largest, Sinope, is 23.6. Other notable moons are Callirrhoe, Megaclite, Autonoe, Eurydome, Sponde, Aoede, Kore, Cyllene and Hegemone. The rest are unnamed. The absolute furthest out moon of the planet Jupiter is the unnamed S/2003 J 2. With a diameter of only 1.2 miles, it doesn't appear to belong to any group. It is 18,355,305 miles out from the planet and orbits it in 981.5 days.